Greetings from Baltimore! I’m attending and presenting at the first OCLC Americas Regional Council Meeting, which unites OCLC libraries from the US, Canada, Central and South America, and the Caribbean. Christopher Cronin, Associate University Librarian for Collections at Columbia University Libraries and the chair of the OCLC Americas Regional Council, introduced the conference, which was held in the Renaissance Baltimore right in the heart of Baltimore’s harbor. The Librarian of Congress, Dr. Carla Hayden, presented our first keynote speech. Dr. Hayden spoke powerfully about the past of libraries and where we’re going in the future. The theme of the conference is the “smarter library” and Dr. Hayden spoke about using technology to make our libraries smarter in order to connect our powerful collections universally and democratically to all of our patrons. Next was Skip Prichard, President and CEO of OCLC, who presented a talk called “A Shared Vision for a Smarter Future.” He connected trends that are happening outside of libraries, including the rise of cities and increasing automation, to the changes that we will need to accommodate within libraries. After that I presented my first session with our Associate Dean, Janet Clarke about our recent renovation. We were in a session with Suzanne Payette, the director of the Brossard Public Library, who also spoke about her library’s recent renovation. Brossard Public Library is near Montreal but has a large immigrant population. The library renovation took into consideration the large numbers of teens and seniors who use the library and made spaces and programming just for them. They also developed a “fab lab” that has digitization equipment and maker technologies. Vice President for Global Product Management. The speakers discussed ways that OCLC is using customer feedback to improve functionality and work smarter for their members. They demoed a new app that OCLC created called Digby, which is meant to help library student workers manage pull lists and reshelving workflows. The second afternoon plenary featured a few more OCLC folks: Rachel Frick, Executive Director for Research Library Partnerships and Jeff Mixter, Software Engineer. Rachel Frick discussed how libraries and OCLC are using data to reach user populations. She shouted out in particular to the Library of Congress labs and the collections as data project. Jeff Mixter talked about two projects that OCLC is working on with data. The first was a project called RAMP, created to measure the impact of institutional repositories. The second focused on the image interoperability framework, IIIF. We took a quick group photo and then I went to see Constantia’s presentation with Michael Miller, Chief Librarian at Bronx Community College and Kenneth Schlesinger, Chief Librarian at Lehman College. They spoke about their book, International Librarianship, and the takeaways they found when working with librarians who had done international projects. The last session of the day was with George Schafer, Lecturer in the School of Architecture at Clemson University and Tony Tallent, Chief Program and Innovation Officer at Richland Library. They built a prototype called the LIT Room for their children’s area that integrated robotics, screens, sound, and lighting to create immersive experiences around reading. The second day opened with Lorcan Dempsey warming up the room with some WorldCat quizzes and a keynote by Katherine Maher, Executive Director at the Wikimedia Foundation. The first plenary was a panel about different institutions leveraging Wikipedia for student learning and participation. The panel featured Andrew Lih from Wikimedia Washington DC, Kelly Doyle, the Wikipedian in Residence for Gender Equity at West Virginia University, Monika Sengul-Jones, OCLC’s Wikipedian-in-Residence, and Scott Walter, University Librarian at DePaul University. 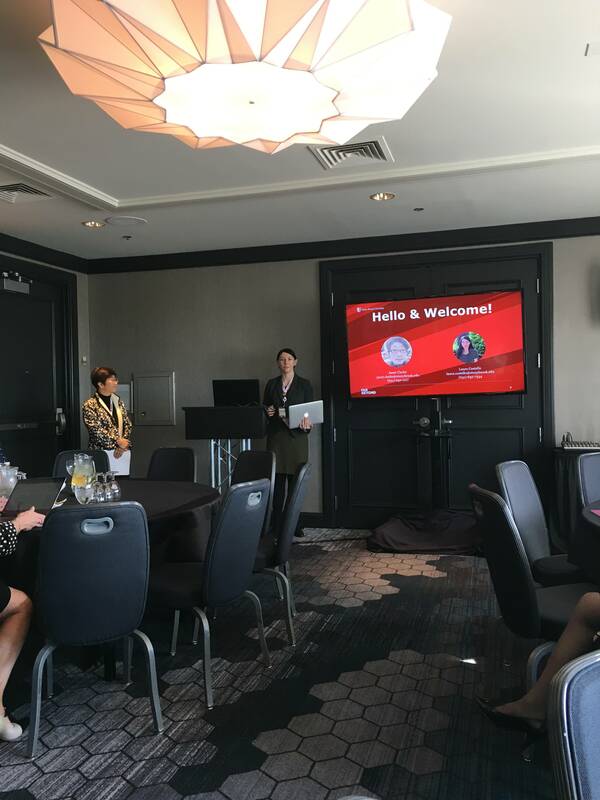 Next, I attended a session about harnessing the power of data presented by Rebecca L. Lubas, Associate Dean at Claremont Colleges Library and Jared Howland, Collection Development Coordinator at Brigham Young University. It was great to attend a more collections-focused session. In the afternoon, I presented my second session on integrating fake news content into the information literacy courses for Writing & Rhetoric. After that I had a little time to tourist and visited the National Aquarium. The OCLC ARC conference was a great mix of public, academic, and special libraries from all over the Americas. The conference was the perfect size and it was wonderful to catch up with connections and make new ones in this community. It was so much fun to be in Baltimore and get a taste of the town! I’ll definitely be back for another OCLC conference.